The key to creating beautiful beach engagement sessions involves skill, timing, lighting, retouching work and cooperative Orange County weather. This image was created in February, which is generally the dead of winter in Southern California. But weather was unusually warm, with temperatures hovering around 85 degrees, so we had a truly perfect summer beach day in mid-winter. 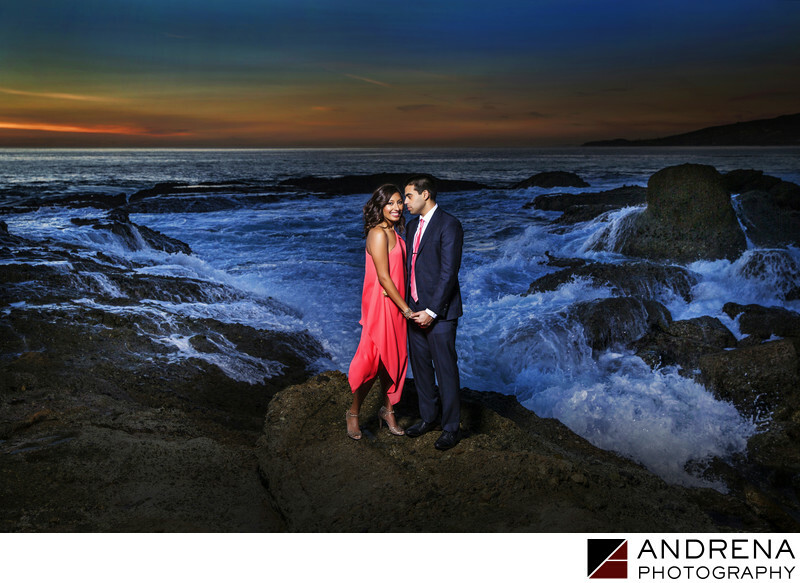 This bride and groom had a vision of standing on beautiful rocks wearing stylish clothing, including high heel shoes. So we hiked over the rocks in climbing shoes, and when the bride got to a safe place, she switched to her heels. The thing that makes this image so lovely is proper use of lighting at just the right time of evening. We also waited lengthy periods of time for the water to splash over the rocks, which added more dimension to the image. Waves do what they want, so we had to wait several minutes until the water broke where we wanted. Luckily, this cute bride and groom were able to hold their expressions and pose without worrying about being swept off the rocks by the rushing water. Use of an assistant is particularly helpful for beach shoots as lighting is usually positioned far to the right or left, while the photographer is standing elsewhere. Creative Photoshop helped enhance the tones in the sky and bring out the detail in the water.